Elizabeth Qualls stands before an easel at a Cumberland Arts Society meeting in Cookeville, where she continues painting. Reading is something I’ve loved to do since I was a student in grammar school, and I continue to enjoy it just as much today as I did then. Overton County Library was once housed in a very small room of the American Legion building on South Church Street in Livingston, and one of the places my family lived was in a house that stood just behind that building. During the time we lived in that house, I spent a great deal of time, especially in the summer months, going back and forth to the library. Not too long ago, I ordered a book after watching a special program on a Nashville public service TV station about the life of an English lady named Tasha Tudor who has written and illustrated children’s books, and is famous for her watercolor paintings and handmade dolls. She is also famous for the 1830s-style New England world she has preserved on her farm in southern Vermont. So it was with much happiness that I discovered Livingston’s version of Tasha Tudor in none other than Elizabeth Qualls. I made this remarkable discovery when my sister, Sue, and I visited recently in her mountaintop home here in Livingston. Elizabeth, the oldest of three children, whose parents were Ben and Elizabeth Hawkins, was born in Knox County. She has a sister, Loretta, and a brother, Ben Jr., who passed away last April. The Hawkins family owned and operated a dairy farm near Knoxville from which they produced bottled milk that Ben Hawkins sold and delivered to grocery stores as well as homes all over the Knoxville area. Along with milk, cream and butter could be bought also. During the years Ben and Elizabeth Hawkins were raising their family on the dairy farm, a young man by the name of B.M. “Buck” Jones came to live in their home in exchange for helping out with the dairy. Buck was not only a hard working young man, but was also a very gifted artist. It was with his help that Elizabeth, who from the very earliest years of her life had been interested in art, learned a great deal about how to mix oil paints and many other details necessary to produce a good painting. Among the many ways Buck used his artistic talent was in the printing of what was known as show cards for large department stores, which advertised special sales, the designing of posters, and he also did a lot of gold lettering on the glass of office doors and on windows of office buildings. 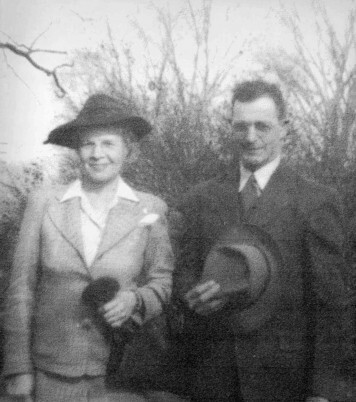 Elizabeth Qualls’ parents, Ben and Elizabeth Hawkins, pose for a photograph before an outing. When Elizabeth was around the age of 16, the Hawkins family moved to Morgan County, where she graduated from high school in Sunbright. Then in 1938, Ben Hawkins found work at the 7-Up Bottling plant in Livingston and the family moved here. The soda drinks were produced in a building that will be remembered as Leslie Brothers Dry Goods on South Church Street. After settling in Livingston, Elizabeth attended college at Tennessee Tech, majoring in Home Economics. It was during this period in her life that she met and later married Herbert Qualls, son of Dr. and Mrs. A.B. Qualls Sr. The wedding of Elizabeth Hawkins to Herbert Qualls took place in the home of her parents on East Broad Street in Livingston. The tall white framed house stood on the lot between the Hamilton house that John Mark Windle now has an office in and the house that is known by most as the Floyd Davis house. An evergreen tree that grew in the yard of their home still remains today, and is the only reminder that the house was ever there. It leans forward probably because it grew too close to the house. 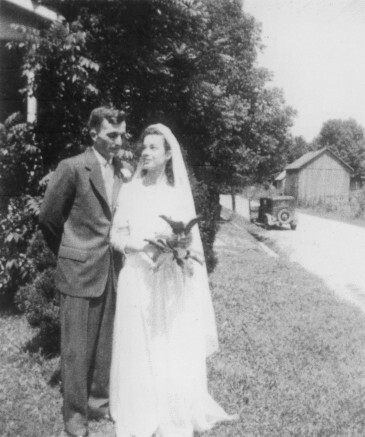 Herbert and Elizabeth Qualls married at the home of Elizabeth’s parents, Ben and Elizabeth Hawkins, on East Broad Street in Livingston. The car in the background belonged to Herbert and the barn was on the Miller property that stood where the East Main branch of First National Bank is now located. After Elizabeth and Herbert were married, they moved into a quaint English cottage-style home on top of Rock Crusher Mountain that was built in 1925 as a farm house for Dr. A.B. Qualls Sr., and was used in its early years as a residence for farm hands. The stone work on the home was done by Harry Springs, and I had to wonder when I looked at the house if his daughter, Mabel, helped her father with this job. Huge hand-hewn rocks make up the fireplace mantel in the living room and another in the front bedroom, all done by the skilled hands of Harry Springs. While attending college, Elizabeth applied for a job as an engineering draftsman with TVA after seeing an ad in the newspaper. Quite a bit of time went by after Elizabeth applied for this position – so much time in fact that she decided someone else had been chosen for the position. But a representative of TVA came to the college she was attending and did some investigating into her background, but waited until she had completed her education, which turned out to be one whole year, before letting her know she had the job. Her work with TVA in Chattanooga involved the drawing of maps for the United States Army for use in overseas maneuvers. All the employees of TVA involved in this type work were sworn to secrecy, and were not allowed to discuss what they did with anyone other than fellow employees. But Elizabeth’s career with TVA did not turn out to be a very long one due to the fact that her mother developed cancer. Because Elizabeth was needed to help care for her, she gave up that position and came home. Cancer took her mother’s life in 1950, around six years after she was diagnosed with the dreaded disease. The Qualls home, which is only minutes away from the public square of Livingston, has the deceiving appearance of being very far out in the country. After visiting their home, and seeing their surroundings, I quickly understood why Herbert Qualls loved the farm he and Elizabeth and their children, Herbert Ritchey Jr., Ann Elizabeth, Clara Louise, and David Edward, shared. In addition to working on the farm, Herbert raised horses and beef cattle, and in spite of the chores that kept him busy, he was also an avid reader. Elizabeth described Herbert as an especially good father to their children, one whom the children at times would completely abandon their mother for, especially if he was out working around the farm. Herbert made sure his children always had lots of farm animals to raise and care for, and was forever adding to the long list of animals that shared their farm. There were dogs and cats, chickens, peacocks, turkeys, miniature mules, a pony, and a jenny, as well as horses. Herbert taught each one of the children to ride the horses. He spent a good deal of time with his family, and completely shared with Elizabeth the responsibilities of being a parent. They were a very close-knit and caring family. Herbert’s activities outside his family included membership in the Eastern Star and the Shriners organizations. He was the recipient of the Scottish Rite award while a member of the Shriners. Herbert and Elizabeth have always been active members and supporters of Livingston First Christian Church (Disciples of Christ). But his life was tragically cut short when, at the age of only 57 years, he died in an automobile accident. Only the oldest of the six grandchildren in the family was born before he died. Even with the busy life she had as a mother and wife, Elizabeth found time to take some courses at the local vocational school in mechanical and architectural drafting. The skills and training she received, in addition to her previous experience with TVA, helped land her several jobs that included a position for a mapping company that mapped out this and other surrounding counties for appraisals and tax records. She was also employed by Ralph Masters, a well-known cabinet maker here in Livingston for many years, where she put on paper architectural drawings of various types of cabinetry. She also worked at Fixture World, a company that among other things, designed and built the layouts for fast food restaurants. Overton County librarian was another position Elizabeth held for 3-1/2 years, and for a period of time, she was also employed at Cumberland Manufacturing. During all this time, her love of art continued, and in 1996, she became a member of the Cumberland Arts Society, an organization which she still actively participates in today. The walls of her home display several of her amazingly life-like paintings. 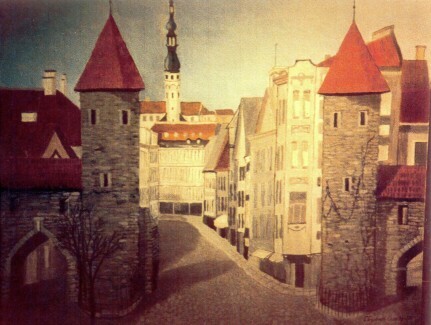 A picture she did for Agnes Sells – a native of the Scandinavian country Estonia, near the Baltic Sea – depicts the main street of Agnes’ hometown, a placed called Tallinn. The painting is like looking at a very good photograph, making it almost impossible to believe it has been painted. It is so detailed in every way that it seems to almost spring to life right before your eyes. Elizabeth Qualls painted a realistic version of the Scandinavian town of Tallinn for her friend, Agnes Sells, showing the main street of Agnes’ home town in the country of Estonia, near the Baltic Sea. Another interest Elizabeth enjoys is collecting old books, but her collection of rocks is one that also needs to be seen to be appreciated. She once went on a three-month long trip to Alaska with some friends, which included doing some fishing, but she found she couldn’t stop picking up rocks long enough to fish while there. She keeps her rocks in separate containers and grouped together according to whatever state she was visiting in when she found them. To me, these very unusual specimens looked like something that should be on display in a museum. The peacefulness of their home is something I felt instantly upon arriving there. The Tasha Tudor book I referred to earlier describes in detail the Tudor home that she refers to as Corgi Cottage. I found Elizabeth’s home very similar. Among the furnishings are many family antiques such as a wonderful old corner cupboard that stands proudly in a corner of the dining room, along with a beautiful ornate organ that was bought for Elizabeth by her father. A picture painted by Elizabeth’s great-grandfather Smith hangs on the wall of the dining room. Could it be that the artistic talent Elizabeth has was handed down from him? Elizabeth said she likes to think so. 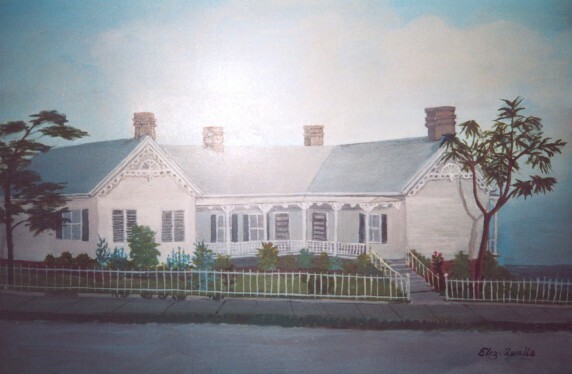 Elizabeth Qualls’ painting of the home of her great grandparents, Wiley Blount and Elizabeth Ann (Lawhorn) Wright, looks very much like an actual photograph. The house was located in Knoxville near the Western Avenue Exit long before I-40 was even in the making. In her kitchen is a small wood cook stove that she still uses as a source of heat. She says it helps to take the chill off on cold, damp days. The wonderful old wooden floors of her home, as well as beautiful chestnut trim around the window frames, has to be seen to be appreciated. Beautiful china and crystal pieces are displayed on an antique buffet in the dining room, but probably the most evident thing in the home was the warmth and inviting atmosphere it offers along with the history the house contains. It was definitely a place I felt I could move into tomorrow and be perfectly content there. Another similarity I found when comparing Tasha Tudor and Elizabeth was that they are both such very gentle, kind, and caring individuals. Although Tasha Tudor is a painfully shy person and Elizabeth isn’t, they each share a love for painting and for living a simple life that doesn’t include every single modern convenience mankind has to offer. The love of being outdoors and being content with the simple things life has to offer are definitely other ways in which they are similar. Upon entering Elizabeth’s dining room the day we visited, the table held a homemade angel food cake she had baked especially for our visit. Another quality she and Tasha Tudor share which is to always make visitors feel welcome with something made by hand from the oven. I want to go back someday soon and walk in the fields and woods near Elizabeth’s home to experience the peace and tranquility that abounds there, and to maybe catch a glimpse of any wildflowers that might grow there. It’s the simple things in life that count, and especially now when we are faced on a daily basis with terrible news about our country’s involvement in another war, and with all the detailed media coverage that gives the impression that we’re sitting in the grandstands watching as the war proceeds, it’s good to know that in spite of what’s going on in our world, the peacefulness Elizabeth’s home and farm offers can still be found, enjoyed, and appreciated.